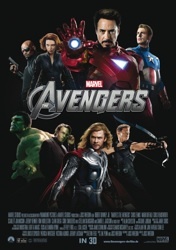 According to IMDB (check the movie's Trivia section) Joss shot scenes for "The Avengers" of Capt. America meeting with a still-alive older Peggy Carter. Whedon also shot other Capt. America stuff he had to take out of "The Avengers" to keep Steve Rogers' story/screen time even with that of the other superheroes. Looks like Joss shared Parick's affinity for this particular character and wanted to give him more props, but couldn't. Should make for an interesting/fun to look at deleted/bonus scene on the Blu-ray. And I'm the opposite of Patrick about his antipathy toward 3D being how he wanted to see "The Avengers" first. I saw it both in 3D and 2D (first) and, while I could live with either one, I kind-of prefer the 3D look I first saw it in. Between my 3D viewing of "The Avengers" and watching "Titanic 3D" this morning for the first time I feel the rising urge to upgrade my 2007 HDTV viewing to one of the now-affordable 3D HDTV set-ups. Lack of content is what kept me from seriously considering 3D for home viewing, but between these two and last year's "Hugo 3D" experience I'm beginning to see the benefit of the technology to enhance and pull one deeper into the experience. And it's not like a 3D HDTV won't be able to play in sharp 2D those 1080p Blu-rays and upconverted DVD's I still plan to get for the stuff that will never get 3D conversion.